Stitchers Dream Day Out & a Story! The Money or the Box! Kangaroos Loose In The Top Paddock!! How to chase the winter blues away! YAY ME!! Thank you Peg! So, one down, four to go. Not only has Peg been very encouraging of those of us who've joined her challenge, she's been inspirational! 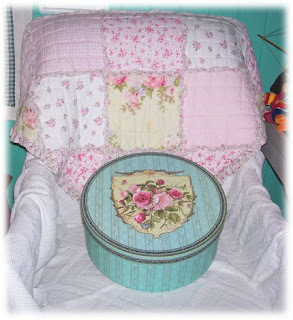 You see, when I popped into Peg's blog to tell her about my first finish, she had posted a photo of one of her own finished projects - a shaggy quilt which is just GORGEOUS! 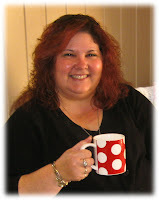 (If you haven't yet visited Peg's blog, I'd encourage you to take a peek - and tell her I sent you over with Bear Hugs!!) Now seeing Peg's beautiful FINISHED shaggy quilt jogged my memory of buying a stash of flannels to make one of these fun quilts. Aren't they yummy?! My colour tastes have shifted a little since I bought these - two years ago!!! OOPS!! Still, they look great all laid out together like this! So finishing this raggy quilt seemed like the perfect project to add as number three to my "Challenge Finish Hit List". Hmmm ... just one problem ... it had been been SOOOOOOOOOOO long since I began this quilt that I could no longer remember HOW to put it all together!! DISASTER! However, the lovely Peg came to my rescue and emailed me some instructions she'd already put together for other bloggers who had been admiring her quilt. PHEW!! Thanks Peg! And her instructions are so clear and easy to understand that even an instruction-impaired person like me can understand them!!! Hmmmm ... it suddenly occurs to me that for a bear person ... 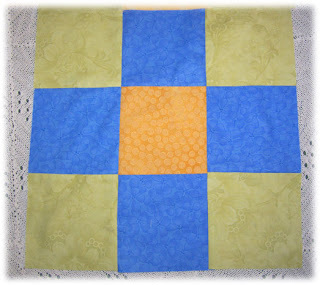 I've chosen three quilts as my first three "Finish" projects - how did THAT happen! Ah well, I should be nice and cosy warm by the end of July and set for many winters to come! Tee! Hee! Hee! And speaking of being a bear person ... some of you may remember me musing (no doubt in a sleep-deprived stupor after my Gayndah workshop weekend!!) that one day I'd have to measure just how much stuffing goes into one of my bears. Well ... I was in the process of making a bear yesterday when the gathering around the neck gave way as I was about to stitch up the opening after stuffing the head, and said bear head fell off!!! Now, for a bear person, it's pretty alarming stuff to see a bear with no head, even if it's a work in progress!! Not only that, the head can be a bit tricky to stuff properly to get a nice finished shape - and I'd just FINISHED this when it popped off! So I had to UN-STUFF the head, undo the neck joint, re-stitch the neck, re-attach the lock nut joint, re-stuff the bear .... AAAAAAAAARRRGGHHHHH!!! Very frustrating!! 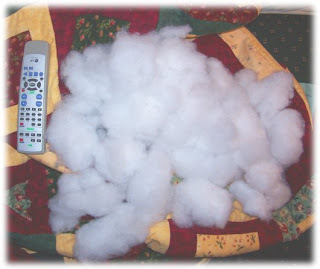 However, to help soothe my frayed nerves, I took a photo of the pile of stuffing that came out of the head to show you just how much stuffing it takes to fill a bear. Remember, this pile was just from the bear's HEAD! I sat the TV remote beside the pile as a reference. The remote is 8" long. That's a LOT of stuffing!!! No wonder bears don't come when you call - all that stuffing must muffle the sound!! Tee! Hee! Hee! In the time I've been playing on my blog, a number of you have left lovely comments about the layout, look or various elements of my blog that you like - THANK YOU!! I have to be honest and say I can take very little credit for the look of my blog - in the technical-nuts-and-bolts-computer-stuff sense. That's all handled by my live-in technical support officer, my beloved Geek Boy, AKA GB, AKA my husband Scott. Well, GB has now set up his own blog (must've seen how much fun I was having!!) but it has a definite technical element that my posts will never have. You see, he's set it up to answer people's computer, electronics, programming questions. He gets asked for advice on so many different things (being the technical genius he is!!) and it occurred to him that some of the questions were repeated by different people, so ... if he answers them on the blog, other people can take advantage of the answers. So if you have any questions you'd like to try to stump him with, pop into his Geek Boy blog and leave your question/problem in a comment and he'll post the answer. I find him VERY handy to have around - but I'm just a bit biased! Tee! Hee! Hee! It's a birthday surprise for a friend, so you'll just have to wait a bit longer before I share!! 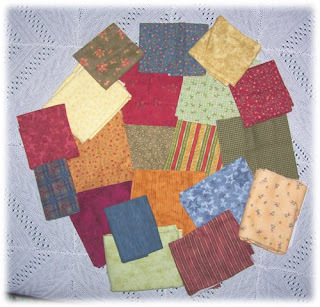 Right now, I'm off to play in my sewing room and cut some more flannel squares!! Til next time, Bear Hugs! Brrrrr!! It's been NASTY cold here the last few days!! Several mornings have seen the thermometers drop to just 2 degrees!! Oooooooohhh! Not fun to get out of bed with those temperatures! In fact, it's getting to the stage where my beloved Geek Boy and I are playing "Rock, Paper, Scissors" to decide who gets out of bed first to turn on the heater!! However, I've compiled a list of some winter warmers. Want to see?? 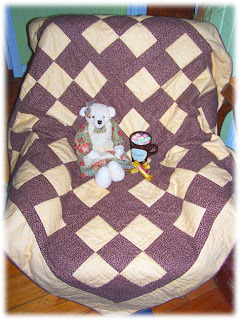 What could be more effective to stave off winter's chills than: a hand made flannel quilt; a cuddly bear to give bear hugs; and a mug of hot chocolate, complete with little marshmallows and a couple of accompanying chocolate bars!! Now, one of the winter warmers pictured above is also my first project finished in the "Finish 5 By The End Of July" challenge that Peg has put out. YAY! I can cross one off the list! Now some of you might think this is a bit of a cheat to be included on my list of five because it was already almost finished before I joined the challenge (publicly, that is! BUUUUUUCUCK!! ), but I'll tell you my justification! You see, I had got my project to the stage where it only needed an hour or so of hand sewing, but then it was put aside, where it sat as I kept thinking, "I'll leave that for now, it won't take long to finish!" Hmmmm, what eventually occurred to me was, if it's so easy to finish, why haven't I done it!! So ... drum roll please!! Ta Da!! My Chocolate Mousse quilt is FINISHED!!!! Those of you who've been popping in to visit me for a little while will be aware that this quilt began as a surprise housewarming gift for a couple of friends who enjoyed snuggling up to my flannel quilt during a coffee and dessert evening. Well ... my wonderful GB managed to let the cat out of the bag. He asked her when the housewarming party was planned and when she said she hadn't really thought about it - was it really necessary? he said yes - so she could get housewarming gifts like the one that had been mentioned on my blog. So ... she then had a peek at my blog and ... it's no longer a surprise. The deal still stands, though - the gift doesn't get delivered until the housewarming party!! Tough, aren't I!! Tee! Hee! Hee! Any excuse to gather a few friends together!! So ... AMELIA ... we're waiting for a date!! Tee! Hee! Hee! 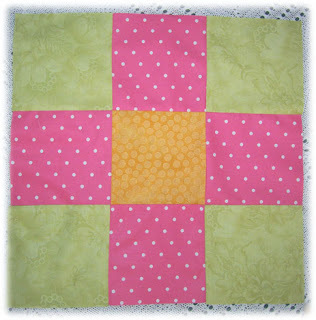 Now, I've also made a bit more progress on challenge project number two - my hip squares. Apparently, after reading my post, a couple of my bloggy buddies had the Huey Lewis song stuck in their heads and found themselves bopping away to it! Tee! Hee! Hee! I confess I did too! Good thing the neighbours didn't spot me dancing around my lounge room!! OK, so here are some update photos. 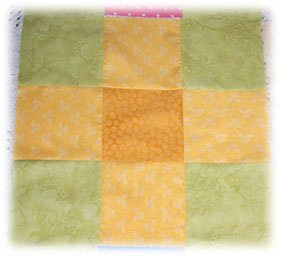 Yummy yellow and apple green - looks a bit citrusy, doesn't it! I won't give the secret of how they'll all go together away just yet, but will give you one little clue towards the final quilt they'll be part of ... the nine patch squares done like this remind me of a daisy flowers, don't you think??? Stay tuned!!! Anyways, the sun has gone down and that night chill is settling in, so I think it's time to go crank up the heater and kick back for a bit before tackling the cooking chores. And what will I have to warm my tummy and keep winter chills at bay???? Til next time ... Bear Hugs! I was cutting ... squares! "Here, there and everywhere - it's hip to be square!" Sorry! Song's still stuck in my head - damn you Huey Lewis!!! Tee! Hee! Hee! I'm not going to tell you what the squares are for just yet, though it is for one of my Finish Five challenge projects. And no doubt the sleuths amongst you will be able to backtrack through my previous posts, follow the clues and find the answer - 42! You know, the answer to life, the universe and everything?!?! Uh oh! More evidence of a mis-spent youth reading! (Hitchhikers Guide to the Galaxy for those wondering!) I'll say no more about my hip squares except, "WATCH THIS SPACE!" Now, having settled lengthy and involved negotiations with my camera, most importantly about it's disinclination to acquiesce to my request (little Pirates of the Caribbean reference there!!) to take photos, and some theological debate between us as to whether a camera that is created to take photos, but refuses to do so can still be considered to be a camera ... I put a different brand of battery in it and it worked!! I then had equally long and involved negotiations (this time amidst some mild course language ... do I now get a PG rating?!?!) with the computer, specifically, the settings in Photoshop, I am now able to do what I need to with my photos before popping them into my blog! Phew!! It really has been a tough afternoon! Perhaps the government should pay me ridiculous amounts of money to sort out their union issues! Tee! Hee! Hee! Hmmm ... now, where was I heading with this sentence??? Ah, I remember! 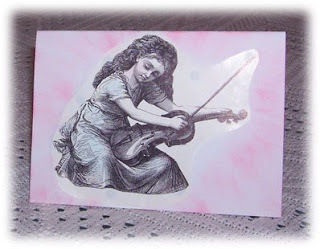 I was reading Leanne Beasley's blog yesterday and she is having a give away - quick! Go and visit her! 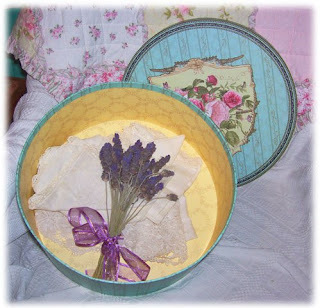 The prize is a gorgeous little tin featuring one of her pretty butterflies from her Butterfly Garden quilt. I left a comment drooling over it, and said that once the above-mentioned negotiations had been carried out, I would post some photos of some of my ever-growing tin collection. So, here we go! 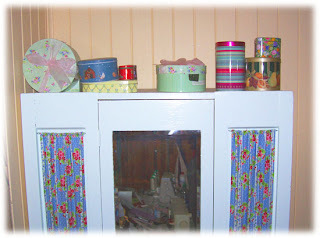 This is my shabby chic sewing cupboard that I did up last year and these pretty tins look very at home on top. Here's a close up of some of my favourites. Aren't they pretty!! 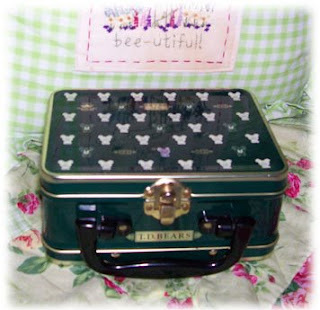 I love the tall stripey tin (it came with yummy caramel toffees in it! Mmmmmm ... Caramel!!!) 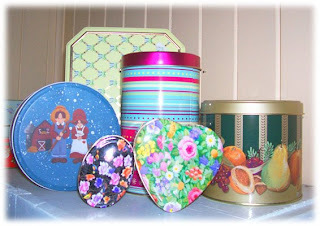 and the little floral heart tin reminds me of pretty china tea cups. This is the handiest little tin I own! Someone gave it to me a few years ago and it was full of teddy shaped chocolates. The chocolates have long since disappeared from the tin and reappeared in a slightly altered form on my thighs!! 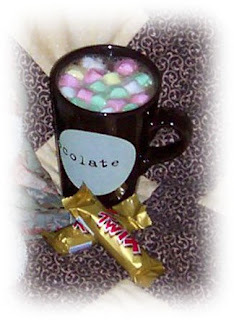 The tin, however, has been much more useful (though the chocolates WERE yummy!!!) 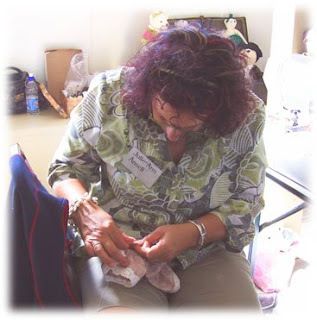 as I use it to carry my hand stitching. The tin is only 5" by 4" by 3", so it fits into my handbag. (OK, so I have a giant handbag! My brother calls it the Tardis, after Dr Who's time and space travel machine because he says it has to be bigger on the inside than it looks on the outside for me to pull some of the things out of it that I do!!) The hinged lid means I never put the lid down and forget where I've left it - don't laugh! I bet you do it too!! And the little clip on the front keeps my bits and bobs from spilling everywhere if the lid slips. I can fit my scissors, scissor keep/pin cushion, threads, needles, stitchery, as well as a few 'just in case' buttons, bows, ribbon and rick rack. Now that doesn's mean I don't need to win Leanne's give-away!! Her tin is a little bigger than this one and if I won (besides doing my version of Snoopy's Happy Dance!!) I would be able to fit slightly bigger hand stitching projects into it to take with me where ever I go - you never know when there'll be a chance to stitch! So hopefully the give-away faeries look kindly on me!!! Tee! Hee! Hee! 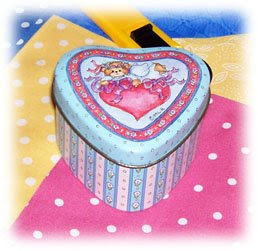 And failing that, I'll just wait til Leanne finds a suitable tin to release her pretty design commercially!! Uh oh! Another item to add to the "Wish List"!! That list just grows faster than Pinnocio's nose!! Well, now that I've dribbled on much more than I intended, I really should go and do some more stitching - too cold to go back into the sewing room, as its one of the coldest rooms in the house! You'll soon find me curled up in the lounge room in front of the heater with a nice cup of tea, waiting for my beloved Geek Boy to come home before I start dinner. And I'll probably still be humming that darn tune ... "Here, there, and everywhere, it's hip to be square!!" Bear Hugs! OK,so usually the dialogue of chickens ISN'T a written language (after all, can you imagine trying to hold a pen with claws?!?!) and so looks particularly odd when typed above!!! Let me explain ... you see, I was catching up with Granny Loz's blog yesterday and she mentioned she had joined the challenge to finish five UFO's before the end of July. I left a comment to say that I was doing so, unofficially, as I thought I might get stage fright from the public pressure and go hibernate for the rest of winter. (Still considering this option since it's rather cold and icky today, but for totally different reasons!!!) Now the naughty Granny Loz wrote back and called me ... GASP!!! 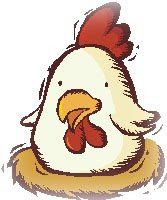 ... A CHICKEN!!!! I'm having sudden flashbacks to Marty McFly in "Back To The Future" - nobody calls me a CHICKEN!! Tee! Hee! Hee! So, I'm coming out of the closet ... so to speak!! 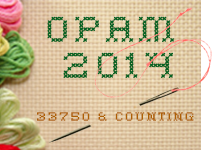 I'm publicly joining in the challenge that Peg at Happy In Quilting has put out. So ... guess what's on MY agenda for the weekend!!! Fly fishing ... Just Kidding!! 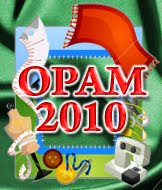 I'm off to the sewing room to nominate five UFO's for graduation. Hmmmm ... where's that hat....!! Oh, before I sign off, if you're a serious bear fanatic, and only the NICEST possible people are!! 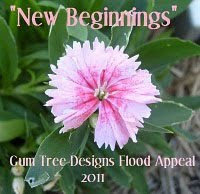 You should check out Liz's blog and fab designs at Teddlywinks Designs. There's lots of cute little bear faces to admire and some fun patterns to add to the practical definition of "Infinity" - a stitcher's/quilter's "TO DO" list! Tee! Hee! Hee! Tell her I sent you to give her bear hugs!! But right now ... "Hi, ho! Hi, ho! It's off to stitch I go. No time to twitch, I have to stitch! Hi, ho! Hi, ho!" ... Bear Hugs! Well ... I said this week was set aside for cleaning my sewing room, didn't I? Hmmmm ... that hasn't happened as yet! The weather has been so overcast and icky and cold that I've just felt like curling up to stitch - so I have!! As a result, the sewing room still looks like a craft and fabric bomb exploded in there, but the Chocolate Mousse quilt I've been working on for friends as a housewarming present is almost finished! The quilting has been completed and I'm half way through the last hand stitching of the binding - perhaps it will be finished tonight while I watch "Criminal Minds". I like a good crime story!! The other thing I've done today is to book my best mate, Lynette, and myself into the annual "Stitchers Dream Day Out". And I had scanned the logo to tease you with, but somewhere along the track, Microsoft has done one of it's annoying 'compulsory updates' and mucked up my Photoshop settings, so that I can't save it in the only format Blogger will recognise! %#$@&#^$%@#$%%$@# Microsoft!!! 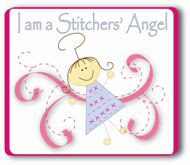 However, I'm VERY excited about being part of the Stitchers Dream Day Out! It's hosted by the Quilters Angel at the Village Green complex at Highfields and I've wanted to attend for a couple of years now and it's just never happened - we've either had visitors, have been away or have had other commitments that kept me from going. So ... as soon as I saw a brochure on a recent visit to QA, I sent Lynette an SMS to see what her calender was like and we've both managed to have the Saturday free! YIPPEE!! You see, Lynette and I have also been trying to organise a 'girlie' weekend for the last few years and, again, something always seems to come up to prevent it. So ... we'll kill two birds with one stone, so to speak ... but not really, as we wouldn't hurt birds!! We'd both love to book in for the two days, but thought it was safest to just book the Saturday in case life interferes again. We reckon we should be able to get the one day to ourselves!! 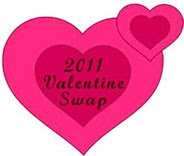 This year's Stitchers Dream Day Out theme is "Vintage" and it will have Debbie McGee (Always Stitchin'), Lesley McConnell (Faeries in my Garden), Leanne May (Candlelight Creations) and Libby Richardson (Art Smart) as the special guest designers, which will be exciting, because I love all of their design styles! Will keep you posted as the event draws closer ... and as I start to count down sleeps in my excitement!! And of course, if you'd like to join Lynette and I in our day of mischief ... I mean STITCHING!! Tee! Hee! Hee! ... you can book your place by contacting Marian at Quilters Angel. And let me know you'll be there so we can catch up - what fun!! 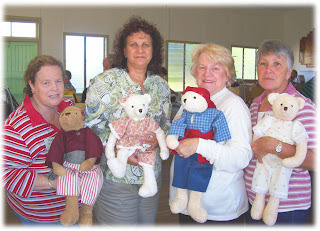 Now, the other thing I wanted to share was a story from last weekend's bear making workshop in Gayndah that I forgot to tell you. I won't mention any names to protect the relatively innocent! We were almost at the end of day one and the little furry critters were starting to look less like crumpled hand towels and more like bears. One lady had stuffed the arms and sewn them in, attached the head with the lock nut joint, stuffed the body and just sewn in the legs when she let out a gasp and a horrified, "Oh no!!" When asked what the problem was, she said, "I've sewn the legs on backwards! They face a different way to his head!!" I tried very hard not to giggle as I calmed her by pointing out that her bear's head was JOINTED, so all she had to do to prevent her bear from watching where he's been was to turn his head around the other way!!! Tee! Hee! Hee! She was a little sheepish, but relieved as she did just that!! So ... I'm now off to keep stitching binding in place - where's Chookyblue when you need her! She's recently had LOTS of binding stitching experience!! Will catch up with you all again soon and hopefully by then not only will my Chocolate Mousse quilt be completed, thereby allowing me to cross something off my "To Do" list, (YAY!!!) but the camera may also have been coaxed out of its sulk and again be taking pics of my progress AND I will have worked out how to reset my Photoshop settings! Hmmm, sometimes working on the computer is the slowest way to do something quickly!!! Until then, take care! Bear Hugs! Here I sit, slumped in exhaustion after a VERY busy, VERY fun weekend of teaching at the bi-annual Gayndah Cottage Craft Riverbank Retreat. As I told you last post, I packed up my bearbies, my beloved Geek Boy, the dogs and other assorted bits and bobs to hit the highway heading west to my old stomping grounds. While I grew up in Mundubbera and that's where Mum and Dad still live, I travelled by bus to Gayndah for two years to complete years 11 ans 12. So, when I was invited to be one of the class tutors for the craft retreat, I jumped at the chance - and I am so glad I did because we had an absolute BALL!! Before going on (and I do GO ON!!) I'll warn you that I took lots of photos (until the camera chucked a fit!!) so this will definitley be a two-cuppa-post!! Now both mornings started out quite a lot earlier than a night-owl like me would choose, as I had to travel half an hour to Gayndah from Mum and Dad's place, but that was the only drawback for the whole weekend. There were four lovely ladies signed up to make a bear with me - Eleanor (who was a member of the organising committee), Julie-Ann, Lyn and Maria. 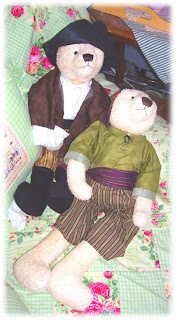 With the option of making either a girlie bear (Taylah Bear) or a boy bear (the newly printed Morgan the Pirate Bear), we had two of each - Eleanor and Maria chose to make Morgan and Julie-Ann and Lyn decided on Taylah bear. So, amidst much chatting, giggling, muttering at scissors that didn't want to cut through thick towelling and a few 'by the pricking of my thumbs' incidents, we got underway. 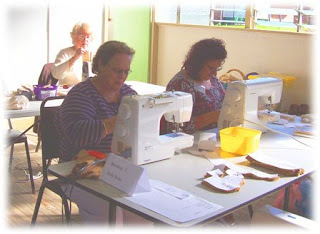 Here you can see Eleanor (back), Maria and Julie-Ann slaving over their hot sewing machines to sew up their bear bits. 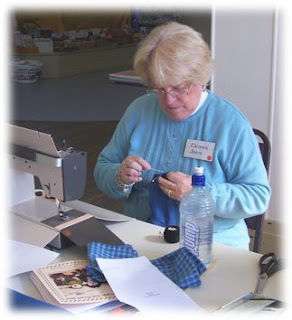 And at another table, Lyn was also stitching away. Then we came to the stuffing stage of our bears and the girls were amazed at just how much stuffing was needed to fill one bear! It's one of those "Believe it, or not!" type of questions!! One day I'll remember to measure so I can shock and amaze you all! What was that? You replaced "shock and amaze" with "BORE"?!? How rude! Tee! Hee! Hee! Uh oh! I think Maria's poor bearbie is like the Scarecrow in "The Wizard of Oz" and singing ... "If I only had a brain"! Tee! Hee! Hee! Poor bear! It's actually a VERY undignified process for a bearbie to be born!! So, by the end of day one of the retreat, we had four bare bears!! Day two saw the girls hit the sewing machines again (and rub their sore hands, cos machines are hard!! Sorry! That whole lack of sleep thing!!) and they got stitching some outfits for some beary fashionable bears. Aren't they a handsome looking bunch - and the bears aren't half bad either! Tee! Hee! Hee! 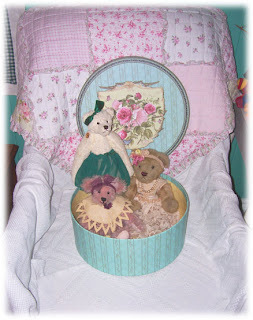 This was the first time any of the ladies had attempted to make a bear like this and in fact, it was the first time that Maria had touched a sewing machine, so they all did brilliantly, I think!!! Aren't they clever chooks!! Of course, I'm a little bit biased as I feel like a proud Mamma Bear admiring her cute and clever cubs!! Well done girls!! And I must not have scared my students too much, because all are now signed up to receive my monthly Tag Along Teddies newsletter (tho Eleanor has been chuckling at my monthly ramblings and updates for a little while now!) 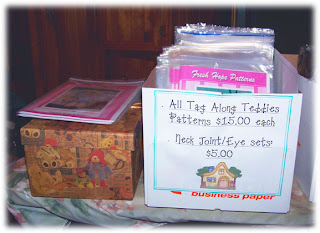 and all have bought more of my Tag Along Teddies patterns to take home and get stitching!! The whole weekend was very well organised and everyone was so friendly! We all played an unofficial game of "musical chairs" at each food break (and we were fed VERY well!!) so I got to meet lots of friendly, talented ladies over the two days. I'm looking forward to heading back again in two years time for the next Riverside Retreat (although the venue has changed from the original one to accommodate increased numbers and it's not quite on the riverside any more - but you could walk there!!) and if I'm not asked back as a tutor, I'll certainly be back to join a class!! Thanks to all who organised the weekend's program and did all the hard work behind the scenes! 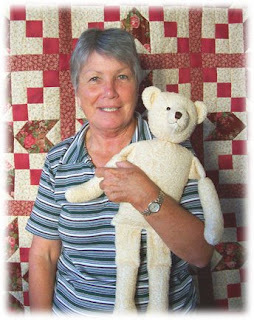 And that includes my new friend and fellow "Mad Bear Woman", Vera, who had been hard at work in the lead up to the weekend stitching bearbies to be included in some lucky number prize packs that were given away throughout the weekend. And guess what?!?! I actually WON one!! YAY! I NEVER win prizes, so that was nice in itself, but to then open up my goody bag and find a new furry friend was DOUBLY wonderful!! If I tell you my new furry bearie's name is Patrick, can you guess which of the bears below he is? If you guessed he's the gorgeous green bear, you're right! Not only did I win a bear, I won a GREEN bear. And not only did I win a GREEN bear, I won a GREEN BEAR WITH ATTITUDE! Tee! Hee! Hee! I told Vera he looks a little eccentric, a little "out there" and a little cheeky, so he'll fit right on in around here!! Thanks Vera!! Patrick has already made some new friends amongst my hug. He took one look at the mischievous glint in the eyes of Rohan and Sawyer and sat himself beside them!! PHEW!! So, you can see why I'm a little weary today, ESPECIALLY, when I add that after the retreat ended at 4pm, I had to drive the half hour back to Mundubbera, re-pack the bags, the dogs, the bears and GB and drive the three hours home because both GB and I had to be grown ups and go to work this morning! However, I'm sure after a few early nights, some hot chocolate and some bear cuddles, I'll be back up to speed and getting into more mischief! So, until next time, take care! I'm off to have some dinner and then - ZZZZZZZZZZZZZZZZZZZZZZZZZ! Bear Hugs! The ports are packed (I figure most of you know by now that I mean suitcases when I say 'port'!! 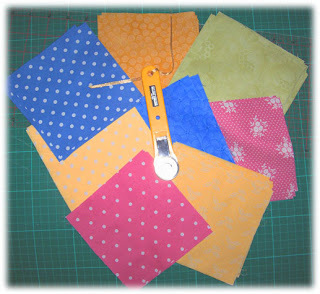 ), the patterns are folded and packaged (phew! 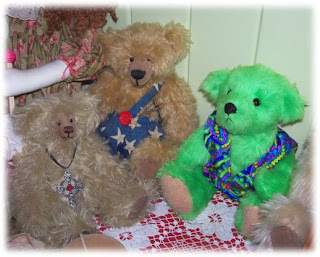 ), the bears have been told to be on their best behaviour and we're off on a road trip! "Get your motor runnin', get out on the highway ... Born to be wiiiiiiiild!!" Tee! Hee Hee! Suddenly having a mental picture of fuzzy bikies roaring along the highway with the wind blowing their fur!! I do, in fact, have my own bear bikie gang ... but that's a story for another day!! The Tag Along Teddies Road train is heading west - ish! 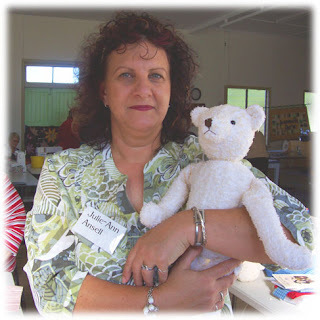 To my hometown of Mundubbera because I'm teaching a two day bear making class in the next town over, Gayndah. It's been a bit of a mad rush this week to get patterns printed and packed whilst fitting in a session of sewing with Miss Mary and the girls from Fresh Hope, a catch-up coffee with my Nutrimetics lady, not to mention my 'grown up' job, where this week I've been holding down the fort while my boss was away. I was a bit worried for a while that the Indians would overrun the fort like in the old western movies, but we survived to tell the tale! Tee! Hee! Hee! As a result, most of the packing had to be done yesterday afternoon. Hmmmm ... not so tidy and organised! In fact, it looks like a Craft Bomb exploded and my sewing room was ground zero!! Guess what the first job on next week's list of "Things To Do" will be!! Yep, excavating the sewing room! Wonder if "Time Team" is available to take part in the archaeological dig!! Tee! Hee! Hee! And of course, the furry babies had to be prepared. So ... can you guess what's in this port? My 'bearbies' weren't all that impressed with their accommodations, but it's the best I could do considering what has to fit into my little two-door hatchback Ford Festiva!! And I'll use the port at the workshop as my display case, so, two birds, one stone!! Not that I would hurt birds ....!! However, I digress! Actually, I love this port (OK, so I love old ports in general!) because if you look VERY closely, there are two tags on/near the handle. One is a paper tag that has been put on at a train or bus station and has the name "I. M. Kent" on it. This is my beloved Geek Boy's Gran Kent, who is 93 years young and still going strong, though she does have the same conversation with you every 10 minutes, because she's forgotten she's had it!! 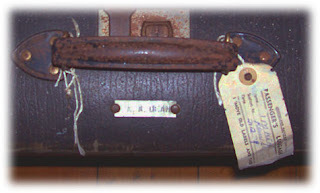 The second tag is the little metal plate which has the name "A. A. Dean" on it. This is the original owner of the port, Gran Kent's father, GB's great-grandfather. The photo doesn't show it very clearly because the flash reflects off the metal, but it's quite clear in person. I think this is part of the reason I love old ports - they each have a story to tell! This one is just a little closer to home and all the more special for it! Now, however, it's time for me to pack MY port and load up. Hmmm ... wonder how we're going to fit all that I've shown you, plus two overnight bags for GB and I, plus two dogs, plus the paraphernalia that goes with two dogs, into my poor little Baby car?!?! Could be a challenge! Perhaps I'll take a photo!! And I'll take a photo at the other end when we open a door and it all explodes out of the opening like in a cartoon!! Tee! Hee! Hee! So ... whatever you're up to this weekend, whether you're packing up to hit the road like us, or staying home to veg (lucky you!) hope you have a great weekend and I'll be back with photos of the workshop! Til then, Bear Hugs! I'm off to hit the highway!!! "Get your motor runnin' ... Born to be wiiiiiiiiild!!!!" OK, so there actually wasn't a 'money' option, but there was a box involved! You see, I received a bit of a surprise yesterday when one of my sisters-in-law rang to say she was popping around to give me my birthday present - from March!! Better late than never!! And I'm always willing to accept surprises!! 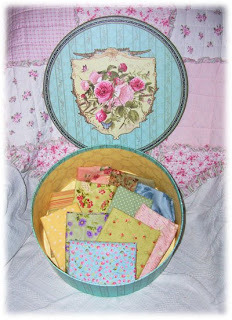 Some of my pretty shabby chic fabrics! Oh dear! I just can't decide!!! I guess I'll just have to keep the lid on for now and admire the pretty flowers and butterfly!! Of course, I did suggest to my beloved Geek Boy that I should go straight out and buy some very special fabrics to store in it!!! For some reason, he didn't think that was a good idea - I don't understand WHY!!! Tee! Hee! Hee! That's about all I've been up to, really, except for making some preparations for the workshop I'm teaching on the weekend, continuing the hand quilting of a flannel quilt for a gift, working on neat copies of my two latest patterns ... hmmmm!! No wonder I'm feeling tired - there's no time for sleep!! Now, for years people have been telling me I've got "Kangaroos loose in the top paddock" - and now there is definitive proof that they're right!! Yep! 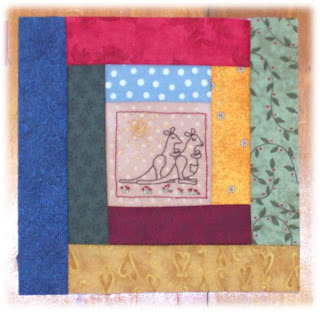 It's that time of month again when the very generous Lynette Anderson posts the new block in her free Noah'a Ark BOM on her blog and this month's critters are the very Aussie Kangaroos! I diverted a little from Lynette's example (what's new, I hear those of you who know me say!!) I gave one of my kangaroos a pouch and long eyelashes - everyone knows there should be a "Mr" and a "Mrs" in each of Noah's animal pairs! Tee! Hee! Hee! Oh! For those of you non-Aussies (and some city-dwellers, perhaps!!) the expression to have "kangaroos loose in the top paddock" means you're "a few snags short of a barbie", "a tinnie short of a six-pack" ... hmmmm ... I'm not sure I'm making this any clearer!!! Ummm ... "a few sandwiches short of a picnic", "not playing with a full deck", "not the sharpest crayon in the pack", "not the sharpest tool in the shed", "reality challenged" .... OH!! ... a little eccentric ... a bit crazy!!!! Phew!! Who would have thought there were so many ways to say the same thing!! Tee! Hee! Hee! But I digress (again, those of you who know me are saying So What's New!!) ... I've now completed four blocks of Lynette's BOM and - shock, horror, surprise!! - that actually means I'm up-to-date!! Must be a first!! Lynette should be proud of me, as I'm usually several steps behind where I should be because I ... get a little ... OK, a lot! ... side-tracked!!! I think the fact that Lynette's blocks are small and very achievable is what's keeping me on track. YAY me!! YAY Lynette!! Oh, you want to see my four blocks as proof?? OK!! See? Not telling pork pies! I'm rather pleased with how they're all looking, though I did notice today that the rabbits and cows blocks are supposed to match up and they're different widths - oops!! I think I've miscalculated somewhere! Oh well, will have to get creative when I'm putting them all together - won't be the first time!!! I was living in Bourke with my beloved Geek Boy, working as the staff Journalist/Photographer/general dogsbody for "The Western Herald" newspaper, getting ready to move back to QLD at the end of the year to be close to both our families. 2. Five things on my "To Do" list? ONLY FIVE!!! I WISH!!! Tee! Hee! Hee! Hmmm ... good question! Where is that list!! 3. Write instructions for "Ladybird Mug Bag"
5. Make myself some lunch!! That's getting more important!!! Tee! Hee! Hee! Hmmm ... not sure there are many I DON'T enjoy, hence my "Rubenesque" figure!!! I do tend to choose savoury over sweet: different cheeses, bickies and dip, cob loaf dip, bickies with cheese and tomato, cheese Twisties ... unless of course it's something caramel, butterscotch or lemon flavoured!!! Then I can be tempted down the sweet snack track!!! 4. Things I would do if I was a millionaire? OK, first, I'd have to establish how BIG a millionaire I was!!! Tee! Hee! Hee! * Pay off family members' mortgages!!! * Find the perfect spot for, and establish our dream B&B. That would do for a start ... for the first month!! Tee! Hee Hee! 5. Places I have lived? Several of those towns involved more than one address, too! My Dad used to work for the National Bank, so growing up we moved round every few years until he left the bank and we settled in Mundubbera. Then, after I left home, I seemed to move every 12 months or so - sometimes more often - with the uni thing!! Okey doke! So, now I'm supposed to tag five people - hopefully who haven't been tagged before! WHEW!! That was a bit of a brain-bender!! However, I've now tagged people so it's done! Yay!! And now, I think I'm off to cross number five off my list of "Things To Do" cos my tummy is telling me it's past it's lunch time!! I feel a bit like Snoopy, except I don't hear cookies calling to me, I hear a yummy toasted ham and cheese sandwich calling my name .... "KRIIIIIIIIIIISSSSSSSS!!!" Tee! Hee! Hee! So until next time, be good and have fun! My Mum used to say this to my brother and his response was always, "Well, which one is it, Mum!!" Now she tells him to "Be Careful!" Tee! Hee! Hee! Have a fab weekend! Bear Hugs! 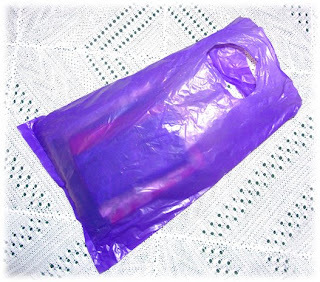 If you saw a purple bag, what would you expect to find in it? What if I told you that I obtained this pretty purple bag and its contents at a spectacular sale at Quilters' World here in Toowoomba?! Aaaaaah! You guessed it - FABRIC!!!!! I had decided that good things come in brown paper bags, but have to amend that to include purple bags now! Tee! Hee! Hee! You see, Pauline (owner of QW) has had a change of circumstances forced upon her - all the the land and buildings around them were sold to a developer, leaving her with no shop car park and no street parking - how rude! And rather inconvenient when one has a business that people mostly DRIVE to!! So ... she decided that if she couldn't beat 'em, she'd join 'em and as a result, she is re-structuring her business. While the shopfront will close in about a week, Quilters' World will still operate from the web site (listed to the left!) 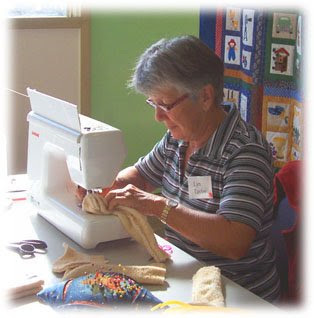 and Pauline will focus most of her attention on her first love - teaching workshops and classes. She has exciting plans to eventually set up a workshop premises in Toowoomba, but isn't rushing into anything, as she wants to find just the right spot. So ...... wow! This story is getting long-winded! To cut the story a little shorter - Pauline had a sale to clear lots of stock so she didn't have to pack and store it and of course, being the helpful person I am, I helped her by taking some off her hands! Tee! Hee! Hee! It sounds so altruistic when I put it like that!! 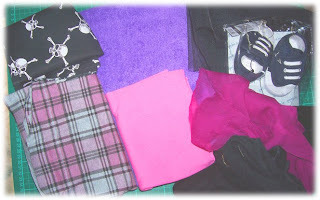 Now, I bought two lots of fabrics. The first was for my stash. 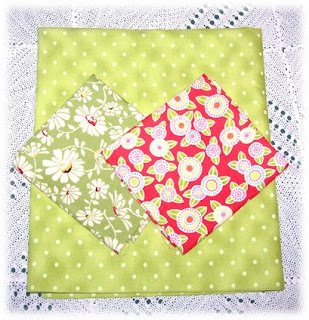 The green with daisies and the red with flowers were both picked with my ladybird quilt in mind. The green spot? Well I got it because ... it was green ... and because it has spots ... and because ... well ... JUST BECAUSE! Tee! Hee! Hee! I have no doubt I'll find a project for it! The second grouping of fabrics was bought for a friend - really!!! Aren't they pretty?!!! 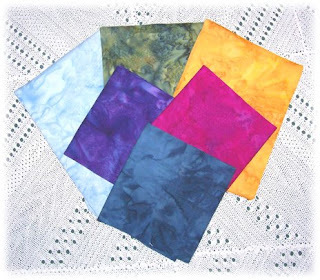 I just love the hand-dyed look, especially in such vibrant colours. These fabrics are destined to go towards making two quilts. 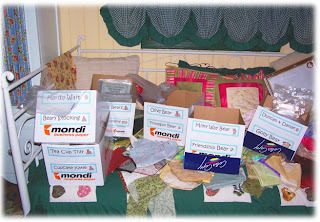 I've corrupted my friend Lynda enough that she's going to tackle her first ever quilts!! Yay!! Spread the love, I say!! Tee! Hee! Hee! It also gives us a fabulous excuse (as if we need one!!!) to go to patchwork shops and then discuss our purchases over a coffee!! 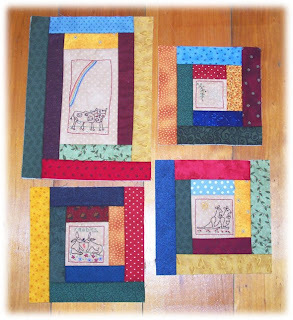 The two quilts Lynda has planned will be for her children, Jayk and Amy. Jayk is mad, keen on dinosaurs of all sorts, shapes and sizes - I asked him the other day which was his favourite in a poster and he pointed to one and said "That one ... and that one ... and that one ... and ..." Bit like me with bears!!! And Amy's quilt will feature mermaids and dolphins. If you ask her, Amy will tell you her favourite colour is ... "Rainbow!" Tee! Hee! Hee! If Lynda lets me loose with my camera, I'll take some photos along the way to show you our progress. Oh no! They look like they've been into the rum stores!! "Yo ho! Yo ho! A pirate's life for me ... HIC!!! Drink up me hearties! Yo ho! HIC!!" I think there's been a pirate party in my lounge room! I wonder how I managed to sleep through it!! And why didn't they invite me!!! Tee! Hee! Hee! I'll have to sober them up to take their official portrait. Hmmm lots of black coffee or a threat to walk the plank - we'll see which is more effective! And on that note, I think I hear the kettle calling me for my afternoon cuppa, so I shall sign off for now. Oh, Linda from Many Things To Do has tagged me to answer five questions and I keep forgetting about it until the end of a post! So, Linda, if you've popped in , I haven't forgotten entirely - just momentarily!! And I promise I'll respond to the tag next post. Until then, hope you all have a productive day - or stop for a cuppa and enjoy a break!!! Bear Hugs! Today dawned grey, overcast, drizzly and cold, with 40km/h winds in Toowoomba today. Anyone would think it was the first day of winter! Brrrrrr!! Only three more months - GROAN!! So, what do you do when you're still recovering from a rather stubborn head-cold, it's cold and icky outside and you just want something to cheer the day up? You travel to exotic locations, meet interesting characters, hunt for treasure and - of course - beat the baddies and win the day!! Yep, my beloved Geek Boy and I indulged in some serious escapism by hitting the local cinema to catch up on the latest Indiana Jones adventure!! Now one of my all-time fave "cheer myself up" movies is the one pictured above, "Indiana Jones. 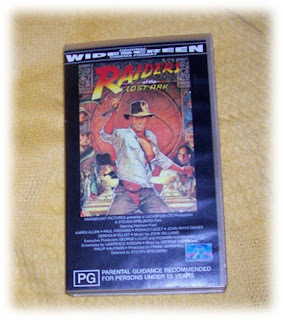 Raiders of the Lost Ark". Yes, yes, I know it's still the video version - the collector's DVD set of all three movies is on my wish list! I've lost count how many times over the years I've watched this movie and it still makes me feel good and laugh, not to mention having one of my all-time fave movie quotes, "It ain't the years, honey, it's the mileage!" Tee! Hee! Hee! Some days I know just how Indy feels!! So, being a big Indiana Jones fan, I've been waiting with great anticipation to see how the latest installment would come together and I have to say, I wasn't at all disappointed!! I won't share too many details, just in case you haven't seen it yet, suffice to say it has the usual Lucas/Spielberg hallmarks of action, special effects, humour, a hint of romance and a touch of the other-worldly! Just BRILLIANT! And it was indeed a good way to escape the cold icky weather. 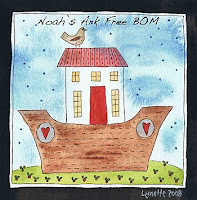 In fact, it seems to have been a case of "Great Minds Think Alike", as when I popped into visit Lynette Anderson's blog (yep anxiously awaiting the next Noah's Ark BOM installment!!) she and Vince were also planning to catch up with Indy - wonder if they enjoyed it as much as we did? Apart from going adventuring witn Indy and his friends, things have been pretty quiet in the Meares' Madhouse as we both try to kick the last of this persistent cold. Having finished 98% of my pattern instruction writing (YAY!!) that I set myself as homework this week, I rewarded myself with a day of hand quilting yesterday in front of the heater and some DVDs. The Chocolate Mousse Quilt I featured a while ago is now about 3/4 quilted, so that's been very satisfying - even if it does make typing this a little uncomfortable, since several fingers are covered in needle-pricks!! My quilting methods may need some refining, but they get the job done!! Oh! 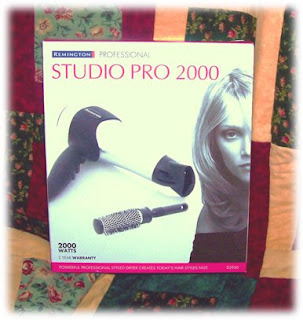 Thanks to all who left comments on my last post telling me they were glad I hadn't fried myself with the hairdryer, although some showed remarkably little faith in my ability to get along in the electronic world!!! OK, so this may have been slightly justified, but still ....!!! Tee! Hee! Hee! Several of you also confessed to having the same or similar experiences, so I don't feel quite so silly - Hopefully Jo has replaced HER hairdryer now and heeded my first-hand experience of what happens when you put it off!! So ... I know you'll all be VERY pleased to know, my beloved Geek Boy bought me a new hairdryer when we sallied forth to do our weekly grocery shopping. Oooooohhhh! Shiny new hairdryer!! Now I just have to work out how to drive it! I'm sure I'll get there, but the first few tries have resulted in a slightly fluffy look!! Oh well, it works for poodles and dandelions, I guess! Tee! Hee! Hee! Well, that's about it from here - as I said, we've been pretty low-key for a few days, but I will point you towards my list of "Blogging Buddies" to the left. I've added some more of my frequently-visited blogs to the list, so pop in and visit them if you haven't already - tell them the Mad Bear Woman sent you! Tee! Hee! Hee! 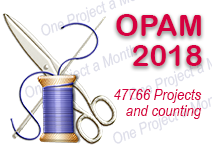 Oh, and I've also played a bit with my blogger profile, adding some more info and a cute tag that my mate Deb from Newcastle made for me from a photo of one of my stitchery designs. Thanks Deb! So, not only can you find out a bit more about me, you'll know when I've commented on your blogs because you'll see my pretty new tag!! 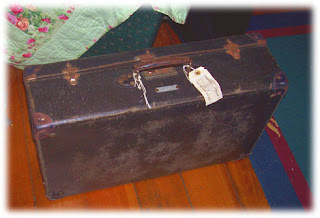 So ... until next time (or when you see the pretty tag appear on your blog!!) Bear Hugs!